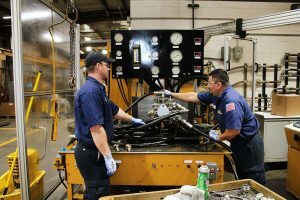 Hydraulic pump and motor repair is an important service for government agencies and contractors looking to maximize the life of their equipment. Gregory Poole has several repair and rebuilding options that save you the cost of replacing expensive hydraulic components while restoring your equipment to like-new conditions. Gregory Poole’s technicians begin each hydraulic pump and motor repair with a comprehensive inspection to determine the best way forward. This can include sectioning or relapping plate and barrel surfaces, resealing or replacing critical components with genuine OEM parts. All repairs involve thoroughly washing pump and motor components to remove dirt and other contaminants before reassembly. Once we complete the repair, we bench test all hydraulic parts and check for leaks to ensure an exceptional level of quality control. For more serious issues, we can perform complete pump and motor rebuilds for gear, vane or piston-type components. This option offers considerable savings over a new replacement. We have an extensive selection of replacement parts — include resealing kits, cartridges and more — and can quickly turn around complex jobs. You can also save time with our exchange program, available for select items. Cost savings — We follow the company’s comprehensive parts reuse guidelines to help you make cost-effective, forward-thinking repair/replace decisions. Quality — We adhere to the highest standards of contamination control in everything we do, eliminating the risk of damage during the repair process. Fast turnaround times — We have access to a nationwide dealer network that makes sourcing replacement or remanufactured parts fast and easy — we can fulfill most orders in 24 hours or less. Expert service and support — We know Cat and allied heavy equipment better than anyone else. There is no better partner for all of your hydraulic repair needs than Gregory Poole. For more information about your hydraulic pump and motor repair options or to request a quote for service, contact a team member today.